A few things come to mind when we think of a film or TV set: actors, trailers, catering tables filled with food, assistants bustling around with papers and equipment, racks of clothes and tons of trash. Literally – tons of trash. In fact, the average commercial shoot can generate up to a thousand pounds of waste per day, says Kris Barberg, account director at EcoSet, an environmental consulting firm that aims to reduce waste in the film industry. Shannon Schaefer Bart, who founded Ecoset in 2008, first noticed a need for more sustainable set practices while working as a film production freelancer. During shooting of the Coen Brothers film, “A Serious Man,” Shannon proposed ways to make the set more eco friendly, implementing reusable water bottles, water refilling stations and comprehensive recycling and composting. In just ten shoot weeks, eleven tons of waste were diverted from the local waste stream. 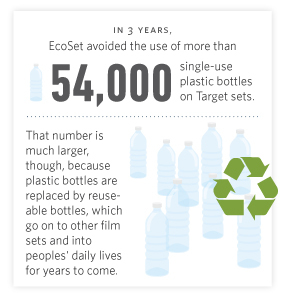 Based out of North Hollywood, Calif., Ecoset has teamed up with Target for its commercial shoots to divert more than 67.5 tons of waste from reaching landfills since 2009. Not too shabby. We sat down with Kris Barberg to find out how EcoSet is cleaning up the film industry’s act. 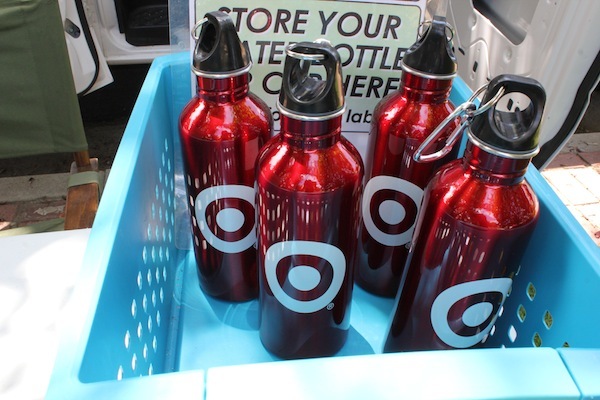 Why, and when, did Target enlist EcoSet’s help? KB: Target started working with EcoSet in April of 2009. Producer Abby Ruben contacted Shannon about bringing the same practices used on “A Serious Man” to Target’s commercial shoots. 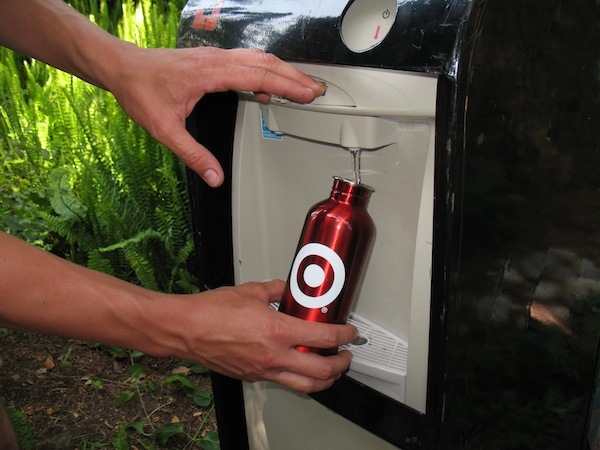 Three years later, Target and EcoSet have diverted 67.5 tons of waste from reaching landfills and donated reusable items to more than 160 non-profits and community organizations in Los Angeles, New York, Minneapolis, Vancouver and Portland. We’ve even taken these practices to other countries like Italy and Argentina. What are examples of how waste is eliminated on Target’s commercial sets? KB: One main initiative is reusable water bottles. 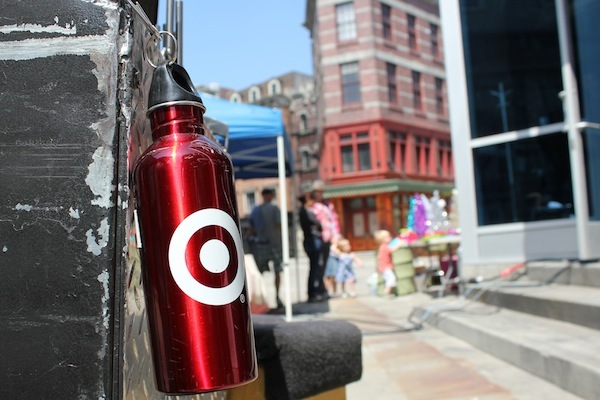 Every crewmember is given a stainless steel bottle with the bullseye logo. And if floor protection is needed, we recommend renting reusable rugs versus disposable tree-based layout board. 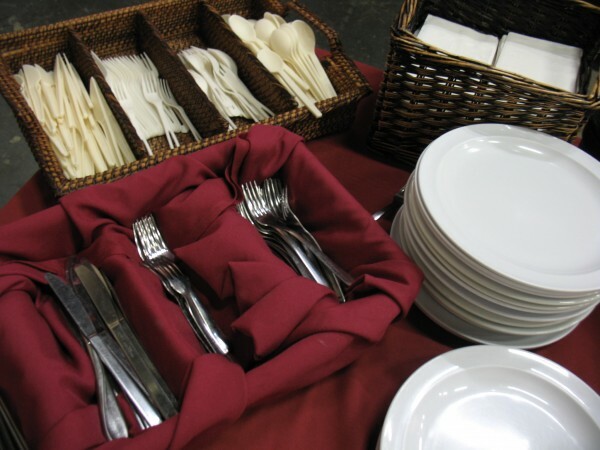 EcoSet also connects with caterers to ask them to use washable cutlery and dishes, instead of disposables. 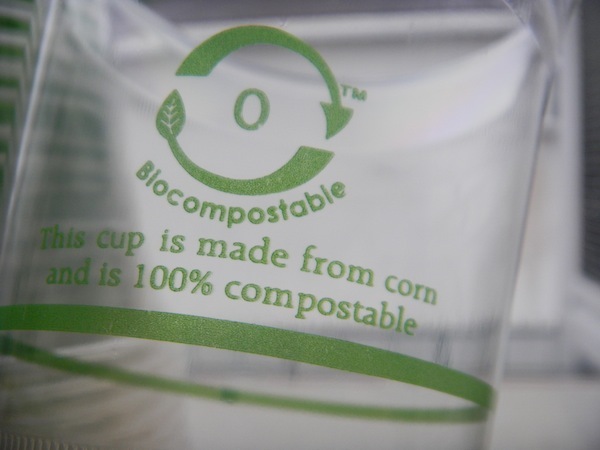 When disposables are used, we make sure they are plant-based and can be composted. 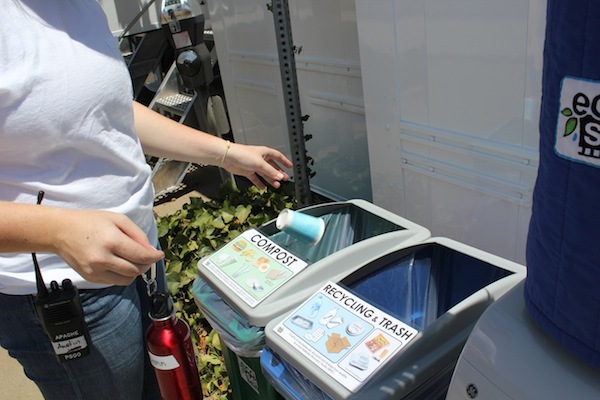 After waste prevention comes waste diversion, so EcoSet’s representatives are on set to oversee the collection of reusable materials, recycling and composting. Why do you think sustainable film production practices are so important? KB: These practices are part of a culture shift. It’s not just about making one shoot “green” – it’s about the ongoing transition to new best practices, leaving behind the mindset of disposability. As clients like Target step forward and commit to more effective use of materials and resources, they’re setting a new standard for how commercials get made. 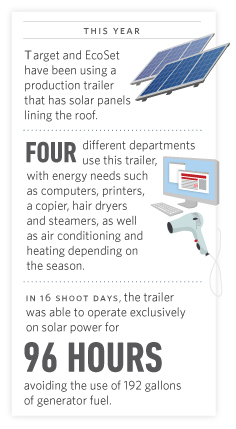 Together, we’re creating a demand for alternative and renewable energy to supply the large power needs on set. What has been the most successful Target set? KB: Success can be defined various ways. On one shoot earlier this year, we diverted 97 percent of waste from the landfill and donated huge set walls to a local theater. Another version of success is working in a new market where these practices are taking place for the very first time, like in Milan, the Caribbean island of Antigua and Buenos Aires. Our simple, practical solutions are inspiring local crews to take on these practices for themselves. One conversation around the snack table can be more powerful than a triumphant rescue of a huge custom prop that was destined for a dumpster. Cumulatively, all of the little details and big changes add up to a lasting transformation on an industry-wide level. What happens to all the extra props and clothes from shoots? KB: EcoSet donates what is seen on-camera and repurposes what is used off-camera. 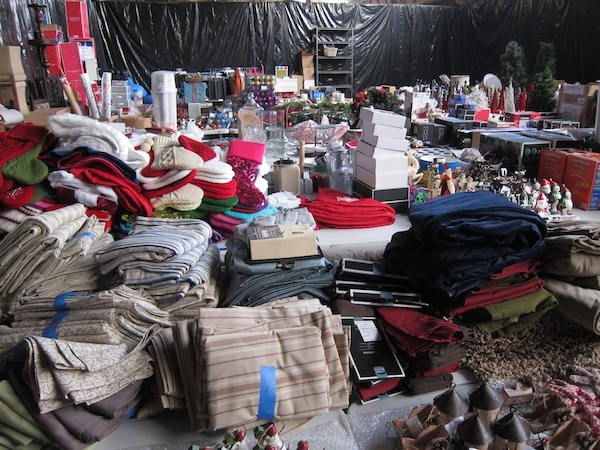 Clothing, props, furniture, set dressing and scenic materials are donated to local partners who have the greatest need and can give the items the longest life cycle. 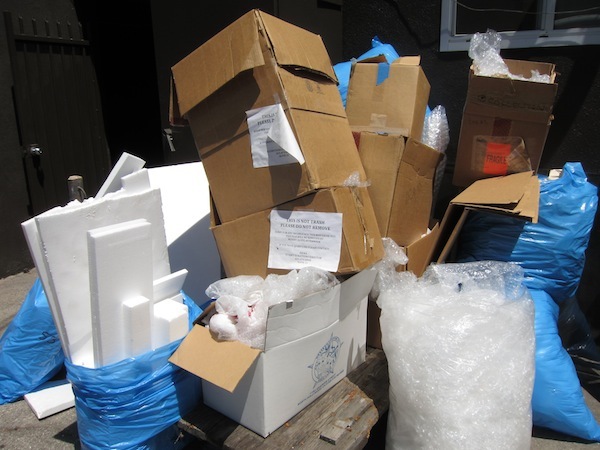 EcoSet also donates discarded items like packaging materials, lighting gels, rope, unused paint and so on to individuals and organizations who can reuse or repurpose them. A recent example of this is the 3rd Annual Target-EcoSet Holiday Donations Event. Target’s productions reused clothing, props and decor from their various holiday ads that were filmed July through November. EcoSet then donated these items to 22 local organizations. Families who couldn’t afford Christmas trees or gifts were among the recipients, as well as non-profits whose budgets didn’t include holiday decorations for their facilities. Now they have decorated spaces to enliven their programming for years to come. 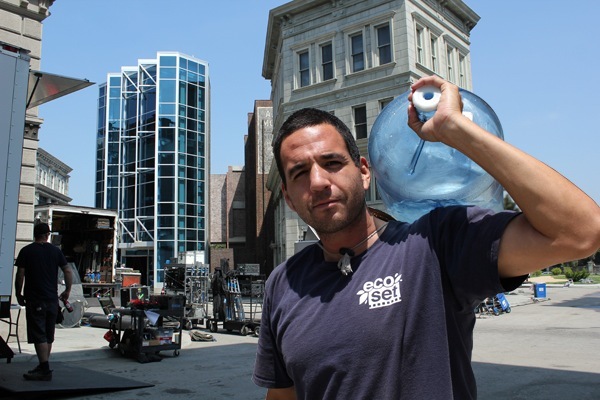 EcoSet has made a huge impact in the film production industry. 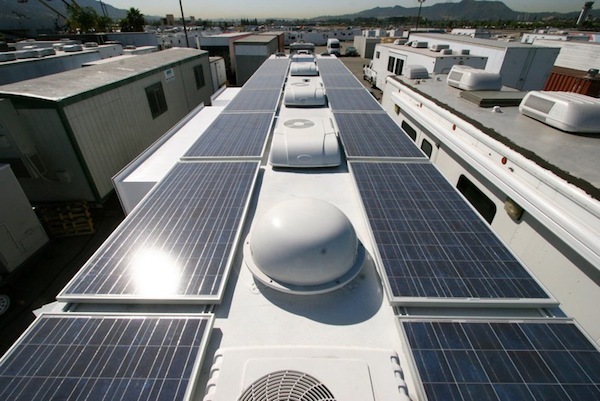 What other industries could use EcoSet’s help? KB: We’re able to advise practices in print production, but beyond advertising, our services translate to events where recoverable materials are being discarded. 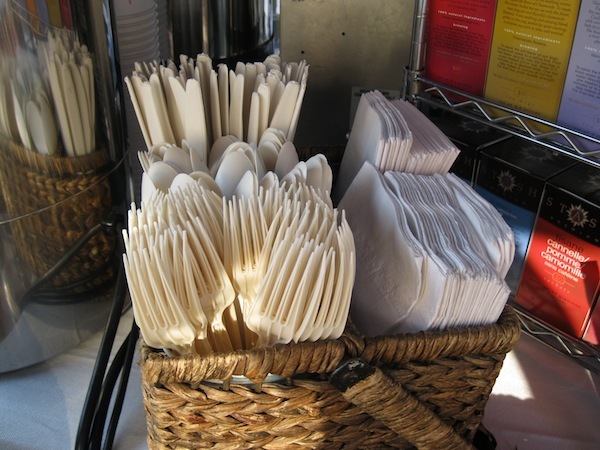 With pre-planning and strategic waste collection systems, most events can be Zero Waste. Many industries and companies are already transitioning to new practices, and any industry can adopt the nuts and bolts of sustainability: waste prevention and diversion, energy efficiency, responsible sourcing and water management. How do you make your home more sustainable? 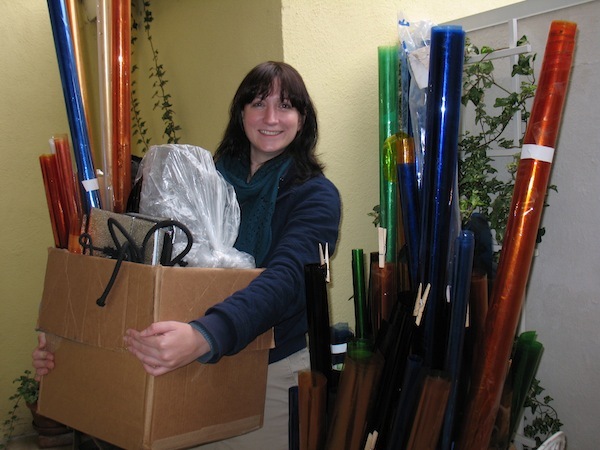 KB: Working for EcoSet has heightened my awareness of everything that passes through my hands. As a farmer’s market shopper and recipient of a CSA food box each week, I’m able to avoid plastic food packaging almost completely. My food scraps get composted and everything possible gets recycled. I keep a basin in my kitchen sink to collect unused water, which is then used to water my plants or pre-soak dishes. I live really simply, and moved into an apartment one mile from EcoSet’s office – it’s easy to bike to work and leave the car parked for days at a time.